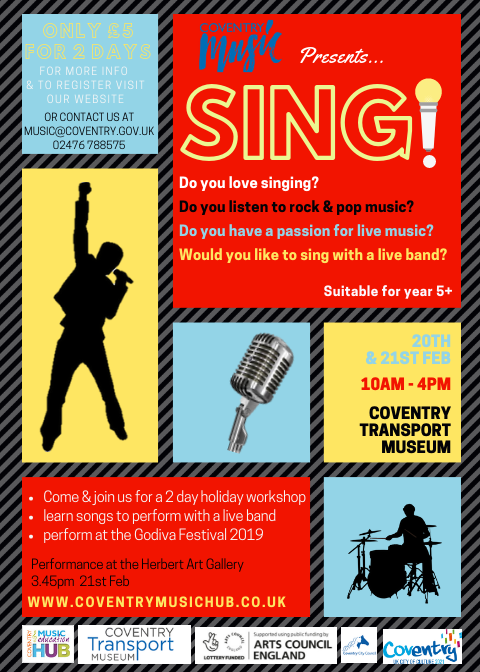 This is a fantastic opportunity to get involved in a new venture being created by Coventry Music. The course is open to children in Year 5 and above and will run for two days on 20/21 February. It will end with a performance with a live band. There could even be a chance to perform at the Godiva Festival in the summer for those who attend. It will be two days of fun and the chance to learn new skills in a relaxed and friendly environment for only £5 for 2 days. For full details and to book please see the website. The performance at the end of the event will be held at the Herbert Art Gallery for friends and family at 3:45pm. children can then be collected from this venue after the performance. On Thursday 21 parents/carers are invited to a short performance at the Herbert Art Gallery. This will be at 3.45pm, following which you may take your child home.